Commissioners were stunned by this price tag, determined by an engineering team that said roads and seawalls will have to be raised and pipes improved to protect streets fromrising waters associated with climate change. “How are we going to manage a $300 million endeavor in little tiny Delray Beach?” Mayor Shelly Petrolia asked. 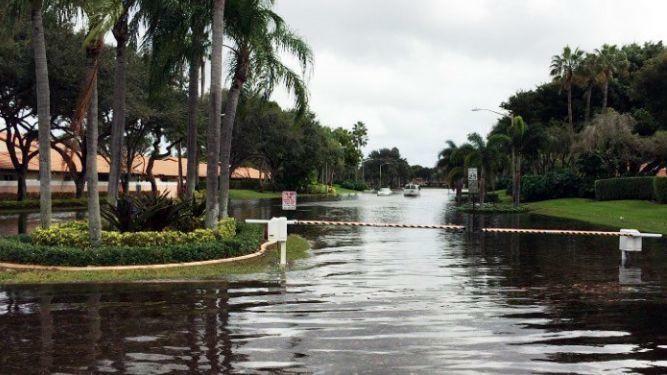 King tides, an October flood exacerbated by the full moon, are an annual problem in Delray Beach. Tides cascade over seawalls intended to keep water from the Intracoastal Waterway out of neighborhoods. Some of these seawalls are more than 70 years old, although they were built to last only 30 years, said Jeff Needle, the city’s stormwater project manager. The Federal Emergency Management Agency requires municipalities to update their plans every five years. Delray Beach’s last update was in 2000, Needle said. The city identified 14 neighborhoods that need extensive repairs to stave off flooding. The most expensive, Tropic Isles, will cost more than $157 million to protect; Atlantic Avenue, the trendy restaurant and shopping district that reaches the ocean, would cost $28 million to fortify. With one mile of public seawall and 20 miles of private walls, the city will have to coordinate efforts with property owners, Needle said. “Our seawalls are not high enough to keep us dry,” Needle said. Petrolia said she wants to send the report to U.S. Rep. Lois Frankel, who represents the city in Congress, so she can help find sources of money to protect the city.